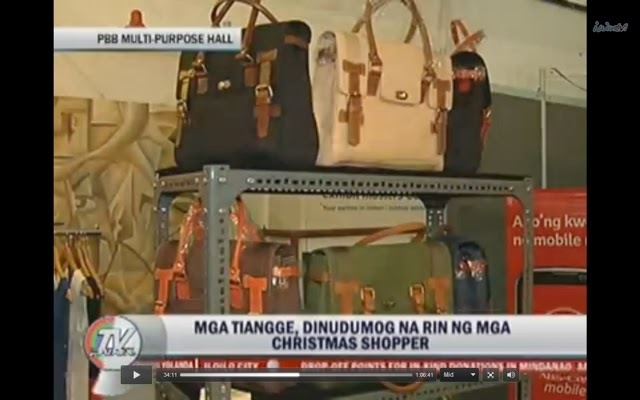 Yesterday was the openning of The Loop Christmas Bazaar in ABS-CBN PBB Hall and I was happy that our bags got some exposures at Winnie Cordero's segment in TV Patrol. I take pride that I have my bags produced in Marikina where the craftsmanship of the manufacturers are really incomparable. Though I've had the opportunity to have them manufactured internationally for a cheaper cost, I opted to pay tribute to the artistry of my countrymen. In my little way, I'd like to contribute in the survival of The bag industry in our country. As Cordero reported, "mga nakamamanghang produktong gawang Pinoy!"